The Monitor & 90’s Flash tease at the end of the preceding episodes was nifty even if it was identical across all three series. Then they played it again at the start of part one for overkill! Earth-90 in addition to Earth-X (inexplicably not Earth-10) means the original count of the multiverse Earths at fifty-two was way off. Dr. John Deegan mentions eugenics in reference to treating psychiatric patients, which is bad guy shorthand that doesn’t make sense in context. (Inmates used to be sterilized in the name of eugenics, but even that wouldn’t wouldn’t be seen as a remedy for their current woes.) 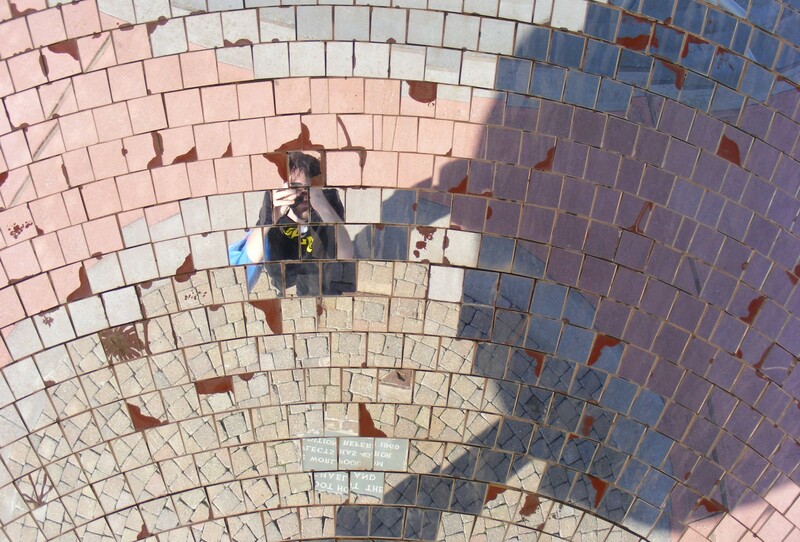 It’d be like basing a lecture on prison reform around the Tyndall effect of Brownian motion. The rude attendees didn’t even let him him finish explaining his crackpot theories before storming out! After receiving The Book of Destiny from The Monitor to rewrite reality, he just swaps Green Arrow & the Flash by accident? Everyone’s initial reaction that this switcheroo is Barry’s fault is perfect. Oliver & Barry are pretty good at being each other, so this doesn’t even feel like as big a deal as it could’ve been. They do get some great digs in at each other. Lighthearted Barry as Green Arrow makes him feel more like the classic comics instead of faux-Batman. Oliver being nonplussed at being a speedster is proof that Arrow doesn’t let Stephen Amell do enough comedy. Quit making him play a grumpus! Then Supergirl says they need to act more like each other to be effective, which further confuses the situation. There’s a joke about the pipeline prison not having toilets! It turns out they do! Thanks for addressing that human rights violation! When did they get plumbing installed in the particle accelerator? In my review of last crossover, I suggested they could fight Amazo in the next. So they did! This AMAZO was made at Ivo Labs & somehow powered by a variant of Mirakuru, yet nobody mentions Professor Ivo & Amazo McBoatface from Arrow’s second season? It can duplicate logos as well as superpowers because why not? It’s missing the striped green pants & gets exploded much sooner than expected. While it would’ve been cool to keep it in play as a recurring foe, AMAZO’s such a powerful threat that they have to take it off the board immediately. For some reason, Barry was right that it couldn’t run while phasing even though he does so constantly. Brainiac-5 singlehandedly vanquishes it on the rematch because he’s a smartypants. Whereas first third on The Flash was a fun, the the middle installment couldn’t resist Arrow-ing it up! All the scenes at ARGUS were glum & cranked the Olicity melodrama to eleven. Why bother with that when you have Batwoman? 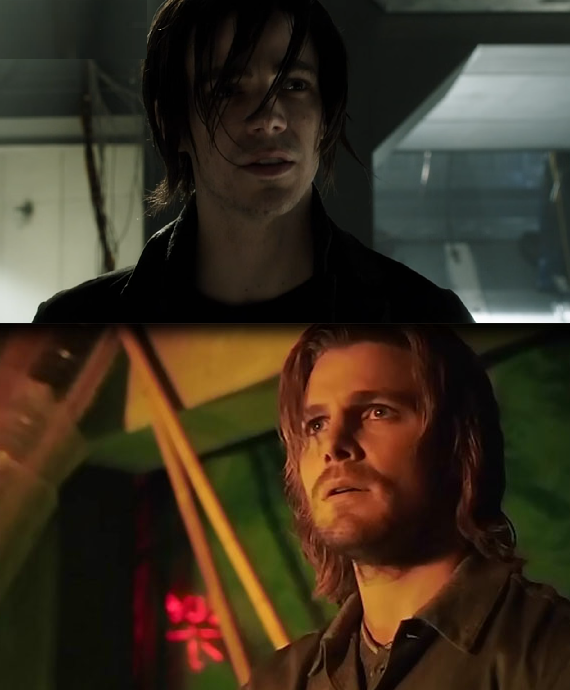 While redoing the “previously on” with Grant Gustin in Stephen Amell’s place was cute, the previous chapter showed they didn’t trade memories. Diggle is Green Lantern of Earth-90, but we don’t get to meet him! It turns out Batwoman is from Earth-1’s Gotham City. I wish she was from Earth-38 to add some more worldbuilding to it. Having a city overrun by supervillains & its own superheroes seems like something that should’ve come up earlier in the seven years of the Arrowverse. (Oliver isn’t even the original vigilante as he claims since the JSA & Wildcat exist.) Maybe Earth-1 Gotham was a regular city until Deegan retconned it into comics accuracy? To differentiate it from Star City & Gotham’s Gotham, her hometown became a cartoonish Hellhole because Bruce Wayne skedaddled four years ago. The middle is essentially a backdoor pilot for a Batwoman series, yet it doesn’t spend enough time with her. The scenes from the previews were basically the entirety of her screentime. She would’ve been more impressive if Green Arrow hadn’t already ripped off the whole Batman playbook for years. In order to be successful, every episode of her forthcoming series must mimic JH Williams III’s gorgeous artwork! (Why does she have a giant bare tree in her apartment armory?) I imagine it’s going to be similar to Supergirl in that it’ll mostly use Batman villains since her supply is low outside of The Religion of Crime. Maybe it’ll even get some of the recognizable ones since Gotham is ending. Of course Arrow already used Ra’s al Ghul, Talia al Ghul, Deadshot, KGBeast, Huntress, Anarky, Firefly, Brutale, Dollmaker, & the back of Harley Quinn’s head. 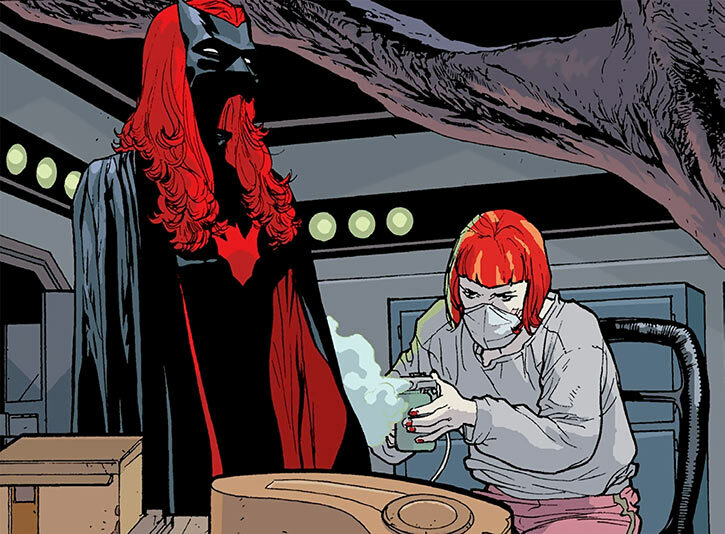 Batwoman has the best DCTV wig. It doesn’t have to look natural, which a point in its favor unlike the flashback & flahforward wigs seen previously. (Awaiting Batman fanboys to scream about how he mistook it for her real hair at their first meeting ergo she most have the most realistic wig ever to deceive his omniscient eyes.) Batwoman’s disguise wig is dynamically vibrant! Since Ruby Rose didn’t live up to nominative determinism by dying her hair ginger for Kate Kane, it serves more of a purpose than Sara Lance wearing a blonde wig over her blonde hair as (Black) Canary. I write this as a not expert on wigs, but I think we can all agree it’s superior to the one Medusa got saddled with in Inhumans because Scott Buck is the MCU’s Kryptonite. The rest of her costume looks great too, so it’s a continual bummer DC Collectibles ceased producing DCTV toys. The biggest waste was Psycho-Pirate. Since he’s once of the few characters that remembers Pre-Crisis continuity, seeding him in now could pay off after they go full Crisis On Infinite Earths! He’s got the emotion-controlling Medusa Mask … that does zilch in this episode. He could’ve been any random Arkham inmate & had the same impact on the story. General audiences will just think he’s a bozo. Why does he know about the looming Crisis when Deegan was the one who read the prophetic Book of Destiny? Shame on you again, Marc Guggenheim! Some of Scarecrow’s fear gas makes Oliver & Barry fight … again. I am just so bored of this trope. It doesn’t help that the second iteration of Vertigo does the same thing as Scarecrow’s gas. How does speedster Oliver not immediately take out powerless Barry? This gratuitous superhero brawl was supposedly in service of them wallowing in each other’s manpain, which emphasizes how peripheral Supergirl is to the story. Neither boy could’ve handled her planetary PTSD! The Supergirl closer was better because it focuses on an Elseworld. I wish we’d gotten here sooner so we could see a few different ones. This one is basically Earth-2. We don’t even get to see most of the series’ cast warped. Kara’s escape hinges on Earth-1 Alex Danvers being fundamentally identical to the Earth-38 one regardless of all the reality manipulation. Despite it being her show, Superman has the brawl with Deegan whilst trying to restore Earth-1. Barry tells Deegan he can’t just decide to be a hero without overcoming circumstance, which sounds questionable. The deaths of Supergirl & Flash are teased if they try to slow the Earth’s rotation with reverse centrifugal force, but the dubious physics of this last ditch plan are moot. Green Arrow convinces The Monitor that his plan of testing Earths to find one capable of thwarting the Anti-Monitor is dumb. (Oliver Queen admittting that he’s an inferior hero compared to his superfriends is one of his finer moments.) So The Monitor anticlimactically makes The Book Of Destiny inert. It’s disappointing Jeremy Davies doesn’t get wear the black Superman suit. He didn’t get enough attention, which is disappointing since he was most compelling when his voiceover in the finale explains he genuinely wanted to help people with his unethical experiments. So he’s actually one of the better criminal psychiatrists at Arkham! There’s no explanation why Deegan’s a dead ringer for Richie Simpson. (Constantine was set on Earth-1, right?) Did my Doctor Destiny prophecy come true? Although he’s never called it, he does talk a lot about destiny before getting a Skeletor facial. The Book Of Destiny fills in for his Materioptikon/Dreamstone. So I’m unilaterally declaring myself correct! Remember, you read it here first! The Kent farm is the same location from Smallville & is introduced with the show’s theme song even though it can’t have been set on Earth-38. Likewise Bane’s hideous mask from The Dark Knight Rises is glimpsed on Earth-1 despite it not being the Nolanverse. These references are deliberately confusing! Maybe the John Wesley Shipp Flash wasn’t even the same one he played on The Flash either? Lois Lane will bash in your brain! Itsy Bitsie Tulloch is also introduced as a hammer-wielding Lois Lane. Since Jon Cryer will be Lex Luthor later (I have concerns about this Superman IV fan service!) instead of Billy Zane, they missed a golden opportunity to adapt “The Lawless Lois Lane & The Musical Murder Of Superman!” She will spawn Superman’s child on Argo to avoid it kicking through her in utero. Will The Daily Planet cover interstellar maternity leave? That also gets her fiance out of his cousin’s hair for the rest of the season. Won’t his protracted absence spoil his secret identity? A problem with this crossover is that there’s hardly any reality warping until the cliffhanger of the second act. For something called Elseworlds, I expected a lot more Elseworlds. Legends of Tomorrow knows what I’m talking about! Last year’s Crisis On Earth-X! was better than both Justice League & Avengers: Infinity War! Sadly this one didn’t follow the trend of the crossovers improving each year. This is more like Invasion! 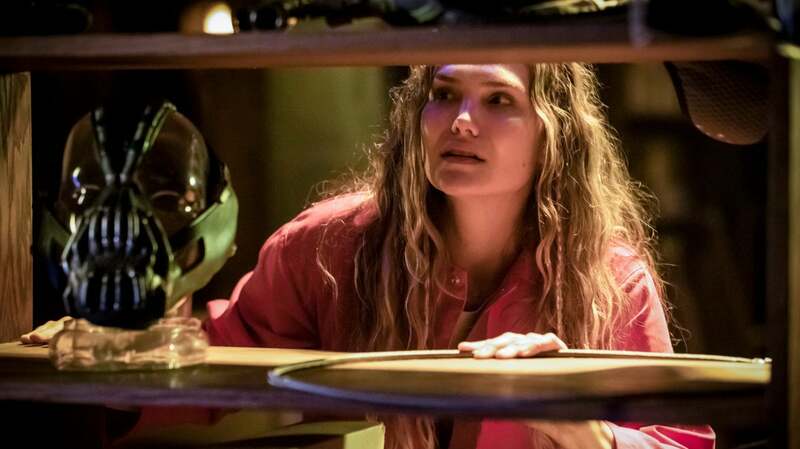 in that each episode is discrete with some overarching connective tissue unlike last year’s cohesive giant-sized story. It did capture the feeling of a big crossover event. The first episode had the exciting novelty of a crossover in a title you already like reading. The next was like being forced to buy a title you don’t read to see too many characters awkwardly crammed awaiting the next plot point. The finale wrapped everything up too quickly. It was still enjoyable even if it didn’t live up to its potential. Maybe next year’s crossover can ditch Arrow for Legends Of Tomorrow so each installment will be of equal quality? Of course it won’t since the next one is officially Crisis On Infinite Earths! (It was presumed that this event wouldn’t occur until 2024.) This was an important event because it streamlined fifty years of confusing comics continuity, but the CW-verse doesn’t have this problem. At most it could relocate the Kryptonians to Earth-1 so they won’t need an interdimensional breach to hang out. The Black Lightning cast could start doing crossovers too! Of course having a Multiverse was a convenient way to explain there whereabouts of various characters that couldn’t fit into overstuffed casts. They could reference the The Adventures of Superman, Batman, Wonder Woman, The Shazam/Isis Hour, Superboy, Swamp Thing, Lois & Clark, Human Target, Smallville, Birds Of Prey, Gotham, & Powerless Earths as being casualties of The Anti-Monitor. It won’t really feel like infinite Earths unless they can afford some guest appearances from cinematic DC thespians. Can they cross promote the DC Universe shows too? The other big moments of COIE were the deaths of Kara Zor-El & Barry Allen, which may be difficult to execute with any heft since they star in two of the series. So they’ve got a lot of planning to do if they want it to live up to the comics’ reputation. For a show specifically called DC’s Legends of Tomorrow, I’ve been disappointed by how few magical DC foes have been introduced this season. Summer camp is very low on the list of things I care about, but I would’ve gotten invested if the villains were an undercover Klarion & Teekl. Why invent a new kaiju when STARRO THE CONQUEROR is ready for its close up? Generic monsters don’t differentiate it Supernatural, Charmed, & Legacies. (“Midnight In Paris would be better with a minotaur.” LoT Writers Room, probably. That was the most moo-ving episode of the series!) The excuse is that real DC characters wouldn’t fit into the stories the writers wanted to tell, but then the writers either ought to re-imagine the licensed characters to fit them or pick new stories. It’s not like they’re unfamiliar with both approaches to adaptation. Constantine cannot be trusted with the space-time continuum, which makes him a perfect fit for the team. When he borks the timestream to save his boyfriend, Desmond Laveau, from Neron, it sends out a prismatic wave across the cosmos in the series’ best cliffhanger! This wast a huge cherry on top of an episode that already had Paul Rubens voicing a murderous Professor Muppet Stein attacking a half-moustached Atom! John definitely outdid “Damn It” Barry! (Fortunately Time Wraiths only care if you corrupt history whilst running & not wearing yellow.) Zari turned into a cat! As much as I like human Zari, they need to find a way to keep cat Zari-Cat (coincidentally played by a kitty named Charlie) around too! “Legends of ToMeowMeow” (just one of many possible great pun titles brainstormed) was what Arrow’s installment of Elseworlds should’ve been! It actually has several alternate realities in one episode, many of which have their own retro intros! Custodians Of The Chronology, Sirens Of Space-Time, & DC’s Puppets Of Tomorrow are all gold medal meta-winners! 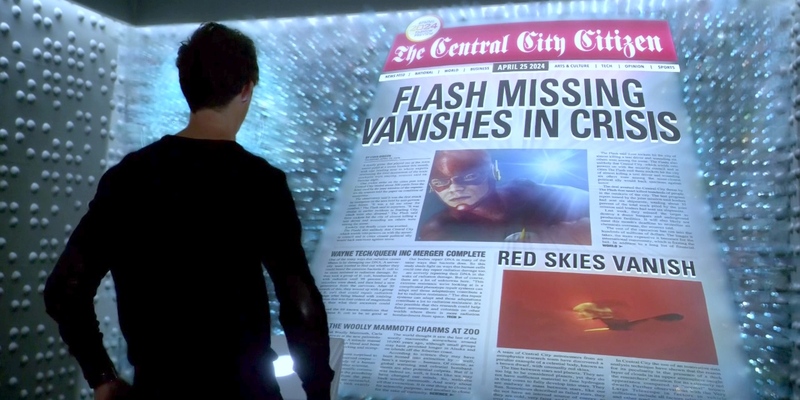 The neat thing is that these “Elseworlds” spring logically from divergences in the timeline. Mona’s attempt to live out The Shape of Water Fur failed, but she’s DTF (Down To Feline). Not only did he make better use of his magic book than Deegan, Heatwave is a better author than I’ll ever be. It turns out both Constantine & Charlie were the linchpins keeping the Leg-Ends from becoming psychotic murders. Then Constantine ‘s true love kiss resets the proper causality! Bravo to director Ben Bray & writers James Egan & Ray Utarnachitt for keeping it tight & exuberant! Give Legends of Tomorrow all the awards! So the legitimutant best part of the annual crossover was the episode that wasn’t officially part of it! Why do we have to wait four months for the remainder of the season? Marvel tries to drink DC’s multiversal milkshake with Spider-Man: Into The Spider-Verse! But Amazon is also having early screenings for Aquaman! Who knows which review will get done first?